One group house will CHANGE EVERYTHING. 4 daring adventurers seek a prophecized additional hero/heroine to challenge the forces of mundane living. THIS SEPTEMBER, a Chosen One will come forward to claim this autumn’s coolest room, available for rent in a house in Tenleytown. This THRILL CHAMBER is available September 1st. Get ready to experience CONVENIENT PUBLIC TRANSPORTATION to downtown DC and American University. 3 blocks to the Tenleytown-AU Metro Station, American University shuttle, and 96, H, and 30 buses. Abundant street parking for drivers with DC registration and Zone 3 parking permit. The house is shared with four other tenants, all young professionals who are FRIENDLY, RESPONSIBLE, and EASY to get along with. 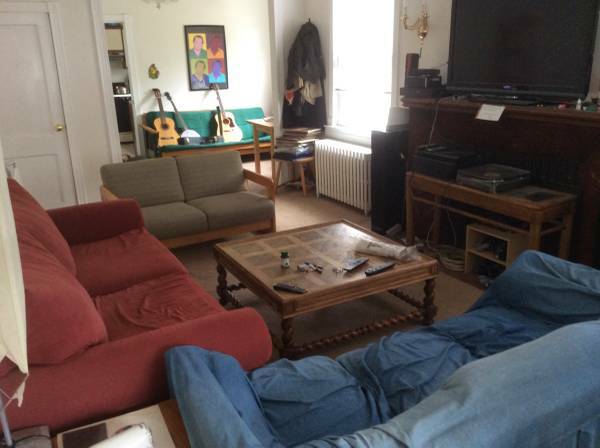 Large living room with BIG HD TV where roommates gather to watch whatever popular shows happen to be on that season. NEW AND SHINY washer, dryer, and dishwasher. YOU WILL FIND a large kitchen with gas stove, a small backyard, a front porch, and a sunny back deck. Plenty of storage space in attic. Rent is $850 per month. Utilities are not included and cost on average about $100/month. The lease is month-to-month, though we’d prefer someone who is looking to stay in the room for at least a year. The landlord is responsive to any issues with the house or large appliances. ARE YOU READY to take your living experience to the next level? Come see the house all your friends are talking about.